Cisco decided to boost its enterprise collaboration stack with products designed to simplify the way companies secure communications, interact with external parties and manage their collaboration tools. The new wares, which were announced at the company’s annual Collaboration Summit last week, signal a renewed push from Cisco in this market, where it battles rivals like Microsoft, IBM, Avaya, Alcatel-Lucent, Siemens and Citrix. 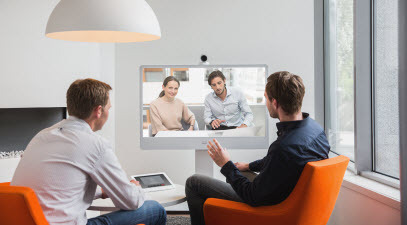 October 23, 2013, at its annual Collaboration Summit event, Cisco announced the next phase of its vision for collaboration, which focuses on delivering innovations that embrace the modern workspace and enable users to work smarter and more efficiently from virtually anywhere. Cisco designed the new solutions specifically with the goal of making it easier for teams to instantly connect communicate and collaborate–so people can respond faster and make decisions more quickly. Tailor-made for the increasingly mobile and distributed workforce, these new innovations are simple to use, are highly intuitive and make collaboration easy to scale across organizations of all sizes. The modern workspace will integrate tools at work with many of the tools employees use at home; support mobility trends that enable people to access information and communicate from their device of choice in ways not possible just a short time ago, and simplify processes–for workers and IT alike–while maintaining security. Today’s organizations need to support mobile workers by providing them with collaboration technologies that are designed around mobility first. Cisco is fully focused on delivering the technologies that remove barriers to instant collaboration and make using technology delightful. To give organizations a fast onramp to secure communications, Cisco announced Cisco Expressway, an advanced gateway that maintains security without the need for device-level registration, accounts, and passwords. This means that users, regardless of location, can gain instant access to all of their collaboration tools – helping to make communications happen faster and more efficiently. As a key component of the Cisco Collaboration Edge Architecture, Cisco Expressway is optimized for real-time collaboration, and secures voice, instant messaging (IM) and video communications from Jabber and TelePresence endpoints with Transport Layer Security ‑ the same technology that’s widely used to secure e-commerce transactions. Additionally, Cisco released Jabber Guest, a solution that utilizes Expressway’s security functionality to give “guest access” to anyone outside a corporate organization (e.g., a business partner, a consultant or a consumer needing assistance) so they can communicate with employees inside it using high-definition voice and video via a web browser or mobile device. Employees can also share data with those outside the corporate organization–and all of this can take place with the touch of a finger or click of a mouse. With this solution, guests simply click on a link provided through IM or on a company’s website, and within seconds they can participate in a two-way video conversation with another party ‑ in the case of a consumer, he or she could use the camera in their smartphone or tablet to show a contact center agent a problem they are having with a product and get immediate feedback. By giving enterprises the ability to add real-time voice, video, and data-sharing capabilities from their websites, email communications and mobile applications, Jabber Guest can help improve sales, speed problem resolution and drive customer satisfaction. Built to support the upcoming WebRTC standard, Jabber Guest can be combined with Cisco Contact Center Enterprise‑a solution that helps to ensure that calls are routed to the right agent for even faster time to resolution. 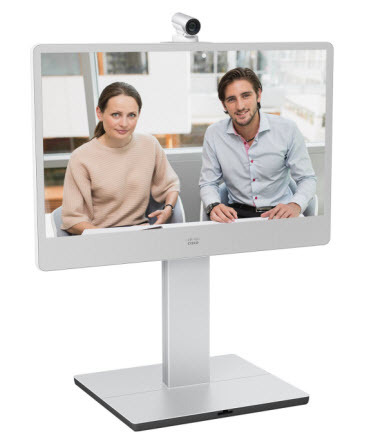 Notes: The Cisco TelePresence MX300 features a more modern, sleek and approachable design that blends functionality and clean lines to maximize aesthetic appeal and usability. This endpoint, which can be quickly assembled and auto-provisioned in about 15 minutes, also comes with a new “dual display” feature that allows users to easily connect an additional screen or monitor, enhancing content-sharing capabilities. Also, optional multi-party conferencing is now easier than ever: up to four endpoints can connect simultaneously without the need for a multipoint control unit, or MCU. The MX300, generally available in December, also supports H.264 SVC for additional interoperability with third-party systems. Cisco also unveiled the Cisco IP Phone 7800 Series. Optimal for midmarket customers, these phones have a new ergonomic design, come with intuitive navigation and wideband audio on all paths, and are available now. Since they are PoE class-1 devices, they are very frugal in terms of power consumption and also intelligent ‑ they can automatically power down during off-hours, saving energy and helping to reduce costs by as much as 60 percent. 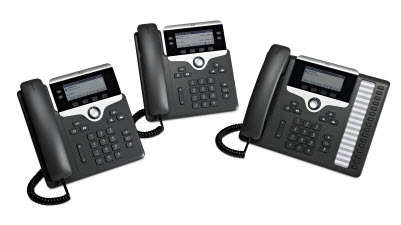 Cisco IP Phone 7800 Series, these phones are very frugal in terms of power consumption and also intelligent they can automatically power down during off-hours, saving energy and helping to reduce costs by as much as 60 percent. Cisco delivered a set of capabilities that blurs the line between the mobile world‑which includes many of the devices end users prefer to use at home ‑ and fixed/on-premise collaboration environments. Called Intelligent Proximity, this innovation allows users to link their personal mobile devices with on-premise products in the office to enhance the experience. Cisco’s first endpoint to benefit from Intelligent Proximity is the Android-based Cisco DX650 Smart Desk Phone. Starting in November, DX650 customers will be able to wirelessly sync their desk phones with their Apple and Android mobile phones. Users can easily import contacts and call histories from their mobile phones to the DX650, and can move a call already in progress from their mobile device to the DX650 (enabling them to take advantage of the superior audio quality of their desk phone when in range) and back again (when mobility is needed). As an organization’s collaboration technology footprint grows in both size and importance to the company, IT also needs new ways of working ‑ namely a streamlined approach to managing these ever-expanding environments. Cisco Prime Collaboration gives IT a single unified management console from which to manage the vast majority of Cisco collaboration products ‑ from it they can deploy servers, provision devices from the phones on users’ desks to the Jabber clients on their laptops, and provide general feature management and service assurance. Additionally, with the emergence of BYOD (Bring Your Own Device) within the workplace, Prime Collaboration allows IT to give users permission to easily add their own devices to the system–phones, tablets, etc. This helps employees to get connected faster and drives more meaningful communications. According to the company, Cisco’s TelePresence MX300 endpoint, available in December, its list price starts at $23,900. Cisco IP Phone 7800 Series, it will be available this month and cost $255. Jabber Guest will be available in January. Pricing will be announced then and will be based on the number of concurrent “guest” sessions the customer wants to have available.